In the 50s, my mother used to whip Jello and Evaporated milk together, pour it into single serve bowls and refrigerate. The result was a creamy foam that separated into two layers, forming a lighter foam on top. She always said it was simple to make but never taught me how she made it. I've tried simply stirring the Jello into boiling water to dissolve, cooling to room temperature and before it sets up, adding the evaporated milk and beating but it doesn't work. I've been looking for a very long time but all the recipes I find are much more complicated than this simple, elegant foam. I'm thinking she may have halved the amount of water the Jello box calls for. Maybe she whipped the milk separately and then added the dissolved Jello? Has anyone heard of this? If so, how is it made and does it have a name? Add boiling water to gelatin mix in a medium bowl; stir 2 minutes, until completely dissolved. Pour into blender. Add enough ice to cold water to measure 1-1/4 cups; add to blender. Blend 30 seconds or until smooth. Add the whipped evaporated milk; blend well. Pour into 4 dessert dishes. Refrigerate until firm. To whip evaporated milk, an easy method is to pour the contents into a metal or glass mixing bowl, and place it (and, separately, the beaters) in the freezer for 30-45 minutes, until ice crystals begin to form. Remove and beat at high speed until thick, 3-4 minutes. Divide dry Jello into two medium sized bowls. Add one cup boiling water to first bowl and stir till all sugar is dissolved. Add one cup of cold water and mix till combined. Pour mixture into clear glasses (6-8 depending on size) filling to halfway point. Chill till slightly jelled, about 30 minutes. When the bottom layer is slightly jelled, whip the cream and repeat the process with the second bowl of dry gelatin, decreasing the cold water to ¾ cup. Whisk in the whipped cream and pour the Jello mixture on top of the first layer. Chill till set, about 4 hours. Warning - speculative answer, here. Both Jolenealaska's link and Dorothy's second answer have the jello set with boiling water, chilled until semi-firm, and then added to the evaporated milk (or whipped cream). This should make a light, fluffy dessert with the right flavor profile. To make it come out in two layers, though, seems trickier - either ending up with a uniform dessert, like Jolenealaska's, or making two batches of of different consistency and deliberately layering them. It may be one of these will be a good enough answer. I was just wondering if there might be a way to make the layers come out naturally, if the dessert will settle on its own somehow - and, so I am offering suggestions, with the caveat they may not work. If the evaporated milk was mixed in to the jello while still hot, either in addition to or just instead of the cold water - it might settle into two layers while chilling. If so, it might be gently folded in pre-whipped - though I'm less sure about heat and the stability of whipped evaporated milk, this recipe here suggests it is possible...different ingredients and method, but still folding in mechanically leavened ingredient and intending to have it separate into two layers - thus, maybe. More simply the evaporated milk might be mixed straight with the hot jello, and blended till frothy and thick, then poured (still hot) into bowls to chill and separate. If the hot and still thin jello is being blended with the evaporated milk, the mixture might not hold together nearly as well as if the jello was half-set and thickened - and so as it cools in gradually separates into a layer of mostly-jello, with a bit of the evaporated milk blended in, and a layer of mostly-evaporated milk, fluffy with air bubbles, with a bit of the jello blended in. Alternatively, you might heat the evaporated milk with the water, and add the jello to the mix. With both the water and milk being hot, it might dissolve the jello mix more easily and also let it settle into layers more easily - though it might also make it a lot harder to froth up and make into foam rather than smooth layers. Idea was kinda inspired by a description of a failed recipe (here, where a similar method caused it to settle into layers - but since the original intended texture was different, it might not work quite the same way. 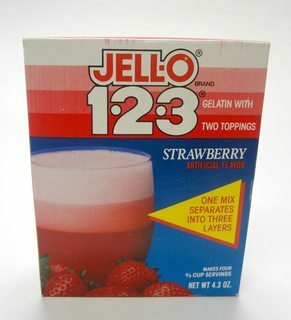 I think what you're looking for is "JELLO 123 "
Evaporated milk, jello. Make jello with only half the water required. Add evaporated milk 3:1 milk water ratio Beat with mixer. Place in refrigerator to set. Every so often (about every 20 minutes the first hour) beat with mixer until just before firmly set. My mother called this fluff. I think it resembles some flummeries. I make this all the time. Great for when your sick or your kids have been sick. 1 box of jello (1 cup boiling water, dissolve jello) 1 Cup cold water. Put in refrigerator. 1 can of condensed milk (unsweetened) cold. Put in freezer till it's very cold. Not the answer you're looking for? Browse other questions tagged dessert gelatin foam evaporated-milk or ask your own question. Can evaporated milk be converted to “regular” milk? Is it possible to make evaporated milk using powdered milk? Mixing condensed and evaporated milk for fudge? Can you make caramel with evaporated milk?